I work for Caring Dads in Leeds, running groups for fathers who are trying to change their behaviour, to become better dads. We’re working from the belief that you are not being a good dad if you are abusive to your child’s mother. For us, the end goal is safer families. In our work we see that some of the men who attend are filled with shame about what has happened in their lives, often about what they have done. This means creating a safer environment for men to talk about their experiences of fatherhood, and a place to consider why things are as they are, and how they need to change. Sometimes this means learning to recognise what violence and abuse actually is. A lot of our work is about helping dads to question thought patterns that have become norms – trying to rethink some quite embedded ways of looking at the world. The Caring Dads model has always had at its heart the idea that real change is cultural, and happens within whole communities. At the same time, our challenge and privilege as facilitators is to work with dads to look in-depth at what needs to change on the deepest level. This means a lot of talking about things that are hard to own up to. Ultimately, we know that this programme is a set of tools for men to make changes if they choose to do so. We strongly believe that, when services are working with a family, knowing more about everyone, including dads, will make everyone safer. This remains true when it becomes clear that Caring Dads is not the appropriate response at the time. The programme has its roots in the insight that, for many, fatherhood is a significant impulse towards change. The journey can begin with a realisation that things don’t have to be as they may have been in a man’s own childhood, that things can get better – that they have to get better. The desire to make this change can be big enough to face up to painful, shameful actions and experiences. We aim to work with that impulse and help men take steps to turn it into positive action. It isn’t always a quick process; we are facilitating a process of change. There is a reason why our courses are over 17 weeks. Our subjective experience is that although this work is not a magic cure for violence and abuse in families, it is the most effective means we currently have for assisting families in becoming happier and safer. In the future I’d like to see Caring Dads groups running in every part of the UK, continuing to grow, continuing to improve their fit for the communities in which they are based. I also hope to see many of the men who have attended Caring Dads making the case in their communities for the changes that they have made in their own lives. Caring Dads works with the belief that the only thing you can change is yourself – and yet modelling non-abusive ways of being men is a powerful advertisement for change at work, in wider families and in communities more generally. As someone with 14 years of experience in the Youth Offending Service before beginning my work with the Leeds Caring Dads team, I feel a sense of privilege that I’m involved in this important work. As men, I think we need to do as much as we can to stop violence against women, and I feel lucky that I get to make a difference in this way. Marcus Uhuru is a BME practitioner and facilitates regular Caring Dads programmes in Leeds City Council. Working effectively with men in families – including fathers in children's social care: Frontline Briefing. 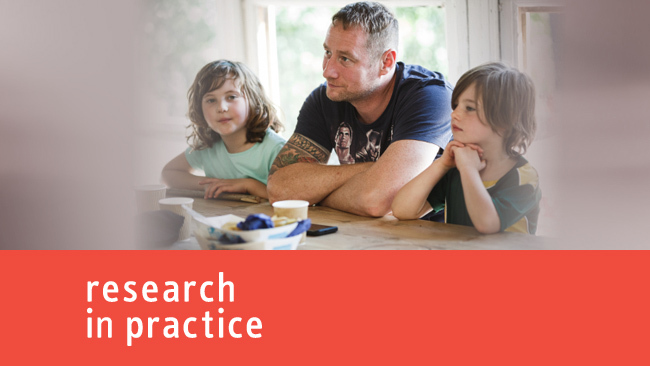 Working effectively with men in families – practice pointers for including fathers in children's social care: Frontline Tool. McConnell N, Barnard M, Holdsworth T and Taylor J (2016) Caring Dads: Safer Children: Evaluation Report. Available Online: https://www.nspcc.org.uk/services-and-resources/research-and-resources/2016/caring-dads-safer-children-evaluation-report/. Caring Dads (2017), ‘One minute guide caring Dads programme’, Caring Dads, Available online:http://www.leeds.gov.uk/docs/104%20%20Caring%20Dads%20Programme.pdf.